The predictions were dire. 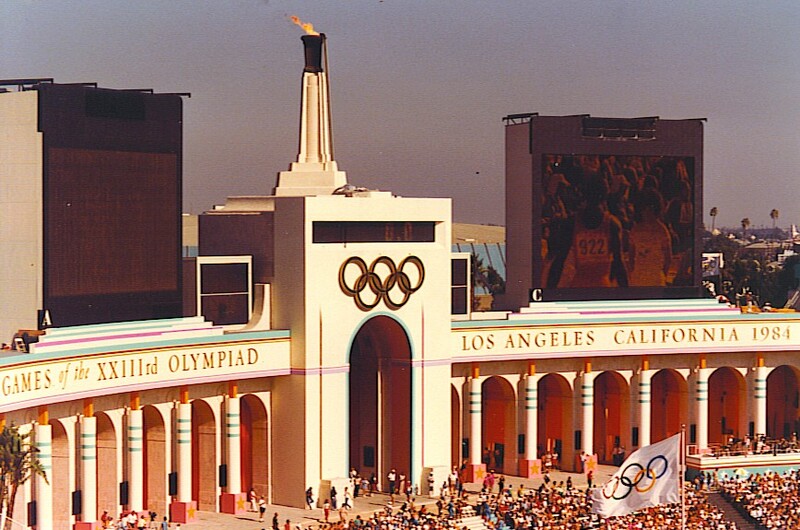 Experts warned that the 1984 Olympic Games were going to cause gridlock in Los Angeles; traffic would be brought to a standstill. Traffic is at a standstill every day in L.A. of course, but somehow this would be even worse. For those of us who didn’t flee the city, things worked out very well. If anything, the traffic was lighter than usual, and for a couple of weeks we had a wonderful celebration with visitors from 140 countries. The Soviet Union, East Germany and several other eastern bloc nations didn’t come to the party — they boycotted the Games in revenge for a U.S.-led boycott of the Moscow Olympics in 1980. Romania showed up, though, and we all cheered them every chance we got. There were several historical highlights at the XXIII Olympiad, including Carl Lewis winning four gold medals in Track & Field, and Joan Benoit’s victory in the first-ever women’s Olympic marathon. Mary Lou Retton won the women’s Gymnastics all-around gold medal. • During preliminary competition in Men’s Springboard Diving, the dive being attempted was announced — “Forward 2½ somersault from pike position” or whatever. No matter what the dive was supposed to be, the divers from Kuwait usually just did a swan dive. They were elegant swan dives, but they didn’t score very well with the judges. • Baseball was a demonstration sport. We saw a double-header: The first game matched Canada against Japan, followed by South Korea against Nicaragua. A lot of the action that day was in the stands, where fans were busy trading pins with each other. The enamel pins featured official mascot Sam the Eagle in a variety of poses representing different sports and countries. Pin trading was brisk at every Olympic venue in 1984, and there still seems to be some market for those souvenirs on the internet. • Joaquim Cruz of Brazil defeated world record holder Sebastian Coe in the exciting final of the men’s 800-meter race. Cruz’s winning time was 1:43:00. After he received his gold medal on the victory stand, the Brazilian national anthem was played — it lasted almost twice that long. Seriously, have you ever heard the Brazilian national anthem? It’s quite beautiful, but you can feel yourself getting older by the time it reaches its conclusion. • One of our son’s favorite Olympic memories involved a misbegotten promotional scheme by McDonald’s. The slogan was “When the U.S. wins, you win!” The hamburger chain distributed scratch-offs with the names of various Olympic events printed on them. If a U.S. participant won a gold medal in the event on your card, you got a free Big Mac. A silver medal was worth free french fries; bronze meant a free Coke. McDonald’s hadn’t counted on the boycott by the Communist countries, and the record medal haul for the U.S. that resulted. Americans won 174 total medals, including 88 gold, which was at least double what McDonald’s had expected. Brian had free hamburgers for what seemed like months after the Olympics ended. This entry was posted in Sports and tagged 1984 Olympics, Joaquim Cruz, Los Angeles. Bookmark the permalink. Thanks for the kind words, Carolyn. Let me assure you that I won’t be running for president. During the campaign, reporters would dig up the details of my shady past — back in the ’70s, I had to pay fines for overdue library books. Exactly right. Thanks for the comment! Ha! Completely forgot about that McDonald’s promotion. Thanks for the walk down memory lane. I’ve got 3 Big Mac vouchers and a Coke left over. Still bummed we didn’t take gold in the 3000 meter steeplechase. Yes, too bad about the steeplechase, but I think you got free stuff for weightlifting and gymnastics and a lot of events that were supposed to be dominated by the Russians and East Germans. I think that’s when you first became a big fan of Greco-Roman wrestling.